One of America’s first great success stories began 230 years ago today. Back then Audubon’s rise to fame was far from certain and definitely not easy. Viewing him as a controversial figure, the scientific community in his adopted homeland even initially rejected his work. Only due to his perseverance and talent was the man whose name today is synonymous with all things bird-related able to secure his rightful place in history. On April 26, 1785, our hero’s unlikely story started in a French colony in an area known today as Haiti. An illegitimate child born to the owner of a sugar plantation, the boy initially resided in the Caribbean. Within a few years, though, his father brought him to France. There he began drawing. Audubon later in life attributed several childhood experiences with his passion for birds, one of which oddly enough involved a parrot-killing monkey. Reportedly, the young Audubon wailed for the dead pet bird, which was later “buried with all the pomp of a cherished lost one” (1). Immigrating to the United States, where he soon married and became a citizen, Audubon continued his lifelong fascination of studying and illustrating birds. His travels took him through much of the continental United States, including parts of New England, the Ohio River Valley, and the Louisiana territory. He interacted with the Native Americans of the frontier, especially the Osage tribesmen (2). On one occasion while hunting a great horned owl, Audubon reported falling into “quicksand up to my armpits” but was pulled free by his companions (3, 4). Like other ornithologists of that day, he often had to kill his specimens. Instead of photography—cameras had not been invented yet—he had to rely on his shotguns (5, 6). Continuing to perfect his artistic skills, Audubon developing a special grid-board with wires for mounting his avian specimens in life-like poses. The belted kingfisher was the first bird he painted via this new system, a method that he would eventually share with other ornithologists (7). His first successful depictions of birds in flight were of a whippoorwill and nighthawk (8). Throughout his lifetime, Audubon illustrated at least 440 species of birds, according to an estimate made in William Souder’s Under a Wild Sky (9). Among these creatures, the wild turkey ranked among his favorites, its image used for his own personal seal (10, 11). Known primarily today for his paintings of birds, Audubon also illustrated other animals (12). He even made a living during some of his travels by working on portraits (13). Richard Rhodes’s John James Audubon: The Making of an American and Souder’s book, both published in 2004, are wonderful sources for an in-depth view of Audubon’s triumphs and struggles. Much of the information cited here is available in those two biographies. From these books, one can easily sense that Audubon was a man of remarkable expertise, talent, ingenuity, and fortitude. Yet, all these traits beg an important question: Why was he forced to seek endorsement and financial assistance in Britain to publish his magnum opus? Part of the problem likely involved Audubon’s personality. He was known on occasion to stretch the truth. He frequently misrepresented his origins, but understandably so due to social stigma and legal issues (14, 15). Other statements he made, though, seem less reasonable, such as his dubious claims about receiving instruction from the French portrait painter Jacques-Louis David and hunting with Daniel Boone (16, 17). Some of his field studies and accounts drew ridicule for misinformation, in particular those regarding rattlesnake behavior (18) and his claim that turkey vultures cannot smell (19, 20). While such circumstances are notable blemishes, one must keep in mind that reputable ornithologists of that time period were not immune to mistakes. Like all great men and women in history, Audubon had his share of flaws. For instance, he and his wife for a few years owned several slaves (21). As noted above, he may have been dishonest at times. Some people, too, may find fault in that he killed hundreds of birds to complete his drawings. Let’s not overlook the fact, though, that he also kept several as pets (22), and that he was concerned about the effects of industrialization on avian habitats (23). But most importantly, besides being the foremost expert on American birds in his day, Audubon was a pioneering artist. Some influential people in U.S. ornithological circles refused initially to acknowledge the value of his work, most notably, George Ord, who held prominent positions in the Academy of Natural Sciences and the American Philosophical Society. Believing Audubon lacked the necessary integrity and aesthetic style for science illustrations, Ord and others within the establishment treated the outsider with disdain. Most likely, Ord, who had played a role in the late Alexander Wilson’s American Ornithology, felt Audubon a personal threat (25). No such resistance occurred in Britain, where Audubon was able to secure the means to print volumes from 1827 through 1838 of his Birds of America, a masterpiece of unequaled quality and scope. Unlike previous illustrations of ornithological specimens from the United States, Audubon painted his birds in life-sized proportions. He also chose to represent his subjects interacting with one another and their environment. And, as a special thank-you to his supporters, Audubon named several species of birds for international ornithologist-friends, such as Charles-Lucien Bonaparte (Napoleon’s nephew), William Swainson, and William MacGillivray (26). Later, praises and admiration followed in his adopted homeland. The National Audubon Society, one of the oldest and most respected conservation groups in the world, was named in his honor. 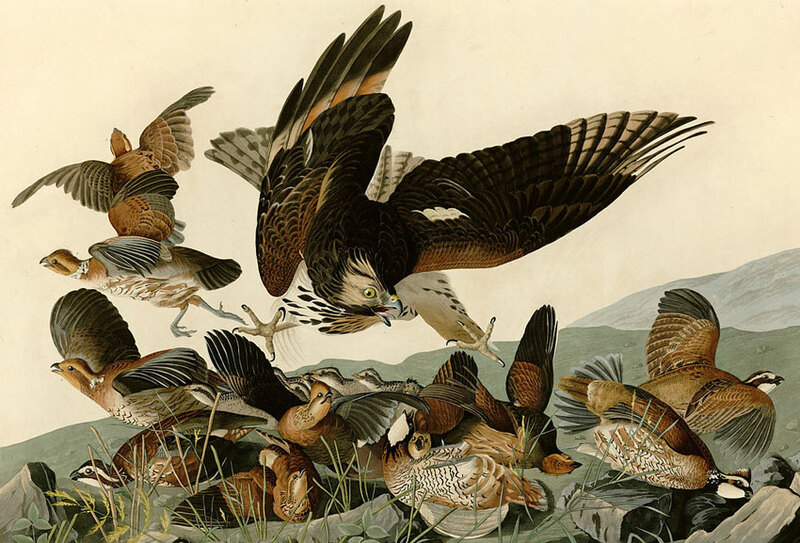 In fact, digital reproductions of Audubon’s work are featured on the group’s website. Also, several historic sites in the U.S. share his namesake, including John James Audubon State Park in Henderson, Kentucky. Rhodes, R. John James Audubon: The Making of an American. New York: Alfred A. Knopf, 2004. pp. 4–5, 21–22. Souder, W. Under a Wild Sky: John James Audubon and the Making of the Birds of America. New York: North Point Press, 2004. p. 147. Rhodes, R. pp. 11, 73–74. Rhodes, R. pp. 240–241, 262–263, 335. Rhodes, R. pp. 145, 216. Rhodes, R. pp. 4–5, 315. Souder, W. pp. 11, 19–21. Rhodes, R. pp. 315, 346. Souder, W. pp. 11, 264–266. Strycker, N. The Thing with Feathers: The Surprising Lives of Birds and What They Reveal About Being Human. New York: Riverhead Books, 2014. pp. 53–54, 62–63. “Here’s Cap’n Flint—I calls my parrot Cap’n Flint, after the famous buccaneer,” says Long John Silver to the young Jim Hawkins. And so with the introduction of this saucy-tongued, sugar-nibbling bird in Treasure Island arises the trope that indelibly connects pirates with these pets. Borrowing from Robert Louis Stevenson’s late nineteenth-century novel, pop culture has since bolstered this image. Parrots are depicted with pirates in subsequent literature, such as the Swallows and Amazons children’s book series of English writer Arthur Ransome, and in numerous cinema features, most notably Disney’s animated version of the J.M. Barrie classic Peter Pan and also the Pirates of the Caribbean movies. And if all this wasn’t enough, a costumed parrot mascot even performs at professional baseball games for the Pittsburgh Pirates. On the surface, the notion that a few sea marauders of the Atlantic kept pet parrots seems plausible. After all, Christopher Columbus reportedly brought back dozens of the birds from his voyages, even offering a couple Cuban Amazon parrots as gifts to Spain’s Queen Isabella (1, 2). Within years of the explorer’s first expedition to the Caribbean, the parrot trade surged. The birds fetched high prices from wealthy and high-ranking Europeans who fancied the exotic creatures (3). By the seventeenth and eighteenth centuries, buccaneers frequented tropical areas. And while there, some would have taken parrots and other exotic animals onboard, if not as pets then at least for purposes such as bribery or trade at coastal settlements (4). Under the Black Flag, David Cordingly’s historical accounts of maritime piracy, and Parrot Culture, Bruce Boehrer’s book detailing the socio-cultural impact of his avian subject, both credit Stevenson’s novel for popularizing the pirate-parrot link (5, 6). However, no mention is made specifically of sea brigands who considered such birds as their pets. In this sense, Boehrer refers to Stevenson’s Cap’n Flint as an “artistic embellishment” (7). On the other hand, Cordingly relates several accounts of buccaneers bribing English officials, offering the birds as a form of enticement or as a shrewd manner for acquiring favors (8). Whether any pirates kept parrots as companions seems questionable. Clearly, though, the sea brigands had access to the birds, as did many adventurers of that time. 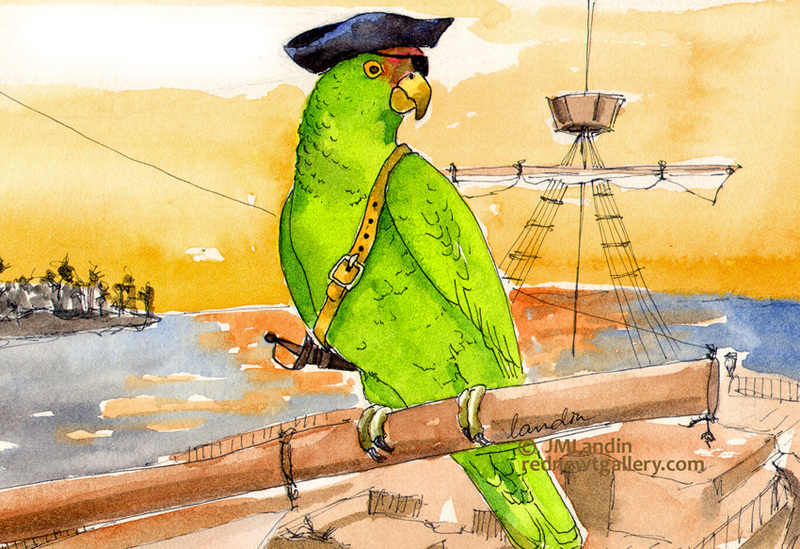 Aside from buccaneers, seaman, and merchants who sailed overseas, only the wealthiest and most well-connected of people could obtain parrots. Pirates, though, didn’t really need them as pets, even if some may have occasionally regarded parrots as “souvenirs of their travels” (9). The value of these creatures is still undeniable, but other items held much greater interest for buccaneers. For the most part, they were seeking treasure as well as the replenishment of food and drink, arms, and supplies for their ships (10). As to the reasons behind the parrot’s popularity with European aristocrats, a couple of characteristics must be considered. First, the bird hailed from far-away origins and boasted colorful plumage. Second, along with its exotic features, the parrot’s ability to mimic human language made it a highly desirable conversation piece—literally—for collectors (11). Obviously, the repeated litany of comments from Long John Silver’s pet created a lasting impression on pirate enthusiasts. Yet for the young protagonist in Treasure Island, the experience appears to be more than just unforgettable. Lederer, R. Amazing Birds: A Treasury of Facts and Trivia about the Avian World. London: Quarto Publishing, 2007. p. 81. Boehrer, B.T. Parrot Culture: Our 2500-Year-Long Fascination with the World’s Most Talkative Bird. Philadelphia, PA: University of Pennsylvania Press, 2004. p. 54. Robbins, L.E. Elephant Slaves and Pampered Parrots: Exotic Animals in Eighteenth-Century Paris. Baltimore, MD: Johns Hopkins University Press, 2002. pp. 25–29. Cordingly, D. Under the Black Flag: The Romance and the Reality of Life among the Pirates. New York: Random House Trade Paperbacks, 2006. pp. 9–10. Stevenson, R.L. Treasure Island. New York: Penguin Group USA, 2008. Oh, the Wonder—and Ugh, the Disgust! People seem to either really like or loathe starlings. Videos of these creatures’ aerial maneuvers have become Internet sensations. On the other hand, agriculture officials frequently regard the birds as avis non grata, going so far as to employ mass extermination measures in the United States. What’s with both all the love and so much hate? A murmuration, the name for a group of starlings, is an amazing sight, something my wife likens to a moving sculpture in the sky. “Murmuration” is also the title of a short online viral video posted a few years ago by Sophie Windsor Clive and Liberty Smith. In their footage, the young women are paddling in a canoe before coming across a sudden swarm of starlings. Their recorded close encounter immerses viewers in nature’s serendipitous beauty, each sweeping movement a spectacle of wonder. Watching the feathered formations bound in flight over Ireland’s River Shannon must have been something special. Fortunately, thanks to the Internet, we can partake in their experience vicariously. “A Bird Ballet,” Neels Castillon’s short film from Marseille, France, evokes similar feelings of amazement. Both his and the “Murmuration” videos are professionally edited and include music. Occasionally, one hears the wowed responses of those shooting the footage. However, the rhythmic sky dance of starlings is so mesmerizing that I prefer watching with the sound muted. No enhancements necessary! Thousands of these creatures engage in ever-changing flight maneuvers somehow without getting tangled and crashing—that’s the spectacular thing about murmurations! How do these birds do this? In the 2014 book The Thing with Feathers, ornithologist Noah Strycker devotes an entire chapter to starling flocks. There he discusses how a collection of the birds form a magnetic system while in flight, and why the number seven is significant in this process. Due to these discoveries, researchers can now generate models that successfully predict the aerial patterns of a murmuration based on its size (3). Strycker touches as well on humans’ love-hate relationship with starlings. He writes about the “Murmuration” video that garnered millions of views in just a matter of days, and also of Google search results easily confirming starlings as “America’s most hated bird” (4). Only introduced to North America in 1890, the European starling ranks today among the ten most populous avian species on the continent. With millions migrating across the country, starlings are generally regarded as an invasive pest. Strycker questions whether the birds deserve their negative reputation (5). Nevertheless, for nearly 50 years, a pesticide has been employed to poison these birds. It’s a practice that continues to this day. A few weeks ago, the Associated Press reported that multitudes of dead starlings had been discovered in the northern parts of Nevada. At first, many residents were uncertain as to what had happened to the birds. People learned later, though, that the United States Department of Agriculture had used DRC-1339, a chemical sometimes referred to as Starlicide, to kill them. In that article, an official provides the rationale for the baiting and extermination of the starlings: “Bird feces can contaminate food and water sources, putting cattle at risk for salmonella and E. coli infections if ingested” (6). In short, the measure was performed for the sake of public safety. The U.S. has used this chemical since 1967 to kill starlings. Once ingested, the agent quickly damages a bird’s heart and kidneys, often resulting in death within one to three days. Officials have also employed DRC-1339 to control populations of pigeons, mynas, gulls, blackbirds, ravens, crows, and other birds (7, 8, 9). Proponents of the compound tout that its toxicity is quickly degraded by exposure to sunlight and moisture. Also, most raptors, with the exception of owls, are not sensitive to the chemical. So birds of prey, as well as many mammals, that may consume the dead starlings are deemed safe. Cats, however, are at risk, and research indicates that the chemical can be “moderately toxic to fish” (10). Several animal organizations continue to frown upon employing DRC-1339 baits. Both the National Audubon Society (11, 12) and the Humane Society of the United States (13, 14) have been critical of its use. Despite claims that DRC-1339 is relatively safe, questions remain, especially regarding whether such mass-killing measures are warranted. And the debate looks to continue, especially with the recent bad publicity in Nevada. In the balance hangs the considerate treatment of wildlife on one hand and the well-being of cattle and crops on the other. 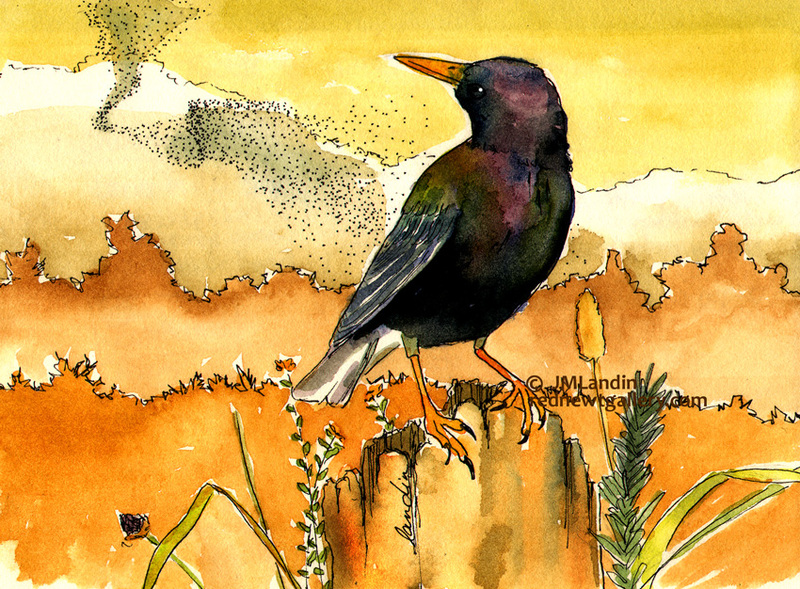 Starlings are marvelous beings, easily adapting to and flourishing in new environments. While their feathered formations awe many folks, the birds still provoke fear and revulsion in others. The dynamics of how humanity perceives these creatures persist in closely bound, twisting motions just like their flight patterns. Acrobats indeed. Oliver, M. “Starlings in Winter.” Best Poems Encyclopedia: http://www.best-poems.net/mary_oliver/poem-13085.html. Dee, T. Year on the Wing: Four Seasons in a Life with Birds. New York: Free Press, Simon & Schuster, Inc., 2009. p. 113. Strycker, N. The Thing with Feathers: The Surprising Lives of Birds and What They Reveal About Being Human. New York: Riverhead Books, 2014. pp. 43-48. Strycker, N. pp. 29-30, 39-40. Griffith, M. “Feds Under Fire for Mass Killings of Starlings in Nevada,” 3/24/2015. Associated Press. MSN.com: http://www.msn.com/en-us/news/us/feds-under-fire-for-mass-killings-of-starlings-in-nevada/ar-AA9WqTh?ocid=AARDHP. Feare, C.J. “The use of Starlicide® in preliminary trials to control invasive common myna Acridotheres tristis populations on St. Helena and Ascension islands, Atlantic Ocean.” Conservation Evidence (online journal), Vol. 7, 2010. pp. 52-61: http://www.conservationevidence.com/collection/7. “Compound DRC-1339 Concentrate—Staging Areas.” Tech Note: Wildlife Services, 4/1/2001. United States Department of Agriculture, Animal and Plant Health Inspection Service: http://www.aphis.usda.gov/wildlife_damage/nwrc/publications/Tech_Notes/TN_DRC1339StagingAreas.pdf. “DRC-1339 (Starlicide).” Tech Note: Wildlife Services, 4/1/2001. United States Department of Agriculture, Animal and Plant Health Inspection Service: http://www.aphis.usda.gov/wildlife_damage/nwrc/publications/Tech_Notes/TN_DRC1339Starlicide.pdf. “DRC-1339 (Starlicide).” Tech Note: Wildlife Services, 4/1/2001. Jonsson, P. “Bye Bye Blackbird: USDA acknowledges a hand in one mass bird death,” 1/20/2010. The Christian Science Monitor: http://www.csmonitor.com/USA/Society/2011/0120/Bye-Bye-Blackbird-USDA-acknowledges-a-hand-in-one-mass-bird-death. Williams, T. “Red Baiting,” 11/2001. Audubon Magazine (online archive): http://archive.audubonmagazine.org/incite/incite0111.html. “What to Do About Crows,” 10/3/2009. The Humane Society of the United States: http://www.humanesociety.org/animals/crows/tips/solving_problems_crows.html. The website devoted to this unofficial holiday, www.dabday.com, recounts that a 7-year-old Dorie frequently accompanied her mother to the hospital. There they visited the girl’s uncle, a war veteran maimed from a landmine explosion. Dorie attempted to cheer him up, suggesting he draw a picture of a bird for her. And so the uncle did, attempting to sketch a European robin. Apparently, the drawing wasn’t very good, but that was okay—his mood seemed to improve a bit nonetheless. During the girl’s subsequent visits, her uncle and eventually the other injured soldiers on the ward felt inspired by her to continue making bird illustrations. Not many details are readily available online about Dorie’s story. Besides the tremendous impact the girl reportedly had on others at the hospital, from patients to doctors, the Draw a Bird Day website notes that the girl’s life was soon cut short due to a tragic accident. She was hit by a car just a few years after her first visit to the hospital. April 8th—the day set aside for people all over the world, no matter their age or skill level, to make pictures of birds—was her birthday. According to the website, it commemorates Dorie’s love of drawing birds as both “a way to express joy in the very simplest of things in life and as a way to help soldiers everywhere forget war and suffering even if only for a short time” (1). Why Dorie chose birds, rather than, say, cats, dogs, or trees, likely lies in the meaning humans have long attached to our winged neighbors. As a symbol, birds generally represent very positive and dynamic things, like hope, joy, and freedom. So I can easily see how illustrating these creatures makes sense as a means of art therapy. For example, after rock musician Edwyn Collins suffered a debilitating stroke several years ago, he later explained how drawing birds aided his recovery. “Drawing was the first skill to come back to me, so it meant the world,” he states in a 2008 online article in The Guardian. “If I can draw, what else can I do? It gave me back my confidence in myself. And my dignity.” His first bird drawing was of a widgeon. That was the beginning. “Each day I drew at least one bird”, says Collins, noting that he could see the quality of his sketches getting better with time and practice (2). Of course, besides its therapeutic value, drawing birds can offer other rewards. First and foremost, the activity can just be a fun thing to do. Kids realize this. Also, they usually won’t hesitate to try their hand at something new. Adults, on the other hand, may need some coaxing. Some folks mistakenly believe that drawing is only for children and professional artists. But having fun requires letting our urge to quickly judge and criticize drop to the wayside so that we can move forward. After all, enjoying the process is much more important than any attachment to the final result. At the very least, drawing can turn into a fun hobby, just like watching birds—or writing about them. So, here’s to Draw a Bird Day. And to that creative “inner child” in all of us! In anticipation of Draw a Bird Day on Wednesday, this week’s post features drawings from our neighbors’ talented 8-year-old daughter, Kaeli. She’s sitting in this week for my wife. So, many thanks to Kaeli! “Draw a Bird Day: in Memory of Dorie Cooper”. Draw a Bird Day (official website): http://www.dabday.com. Collins, E. “My feathered friends”, 10/26/2008. The Guardian: http://www.theguardian.com/artanddesign/2008/oct/27/art-illustration-edwyn-collins. My wife and I feel honored. A few weeks ago this site was nominated for The No Strings Attached Award. As the name implies, nothing is required on the nominee’s part. No entry fee. No submission. The only stipulation for being considered is that another blogger enjoys your site enough to recommend it. Just a little more than six months ago, this blog began with hopes that a few folks may find the material here occasionally interesting. I’m pleased that several people have made this one of their routine stops. Also, I feel especially fortunate that one of these readers would like the A-wing and A-way site enough to nominate it for an award. So, I want to express my gratitude to Marcy Erb. Her Illustrated Poetry already ranks among my favorite blogs. She features her art (photographs, collage, drawings, etc.) alongside works of poetry, including some of her own. I invite you to check out her site if you haven’t done so. At the end of this month, I’ll nominate others for The No Strings Attached Award. Thanks to everyone who has stopped by here. Please stay tuned!